Valspar had a hypothesis they wanted to validate, not only internally, but also with their valued retailer, about the potential for a reemerging category. With a meeting fast approaching, they needed rapid insights, and their traditional methods couldn’t produce results within the shortened time frame. 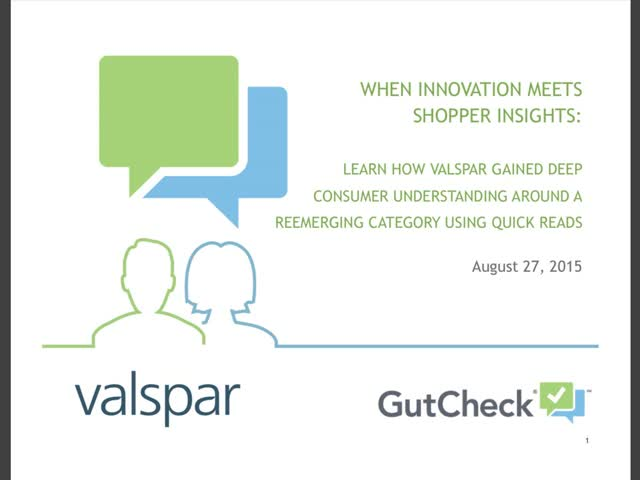 Instead of assuming research would be impossible, Valspar utilized GutCheck’s quick consumer reads and was able to change the game by uncovering unmet needs and incremental consumers in the reemerging category. This consumer understanding gave them the confidence they needed to change the discussion with the retailer and internal sales teams. Based on the findings from our 2016 agile research study—taken by marketers and researchers across industries—we know more and more are experiencing, firsthand, the value in using agile research methodologies for many different needs specific to their roles and company goals. Whether it’s to help make a big decision, develop or grow a new/existing product, understand why a product isn’t performing, narrow ideas, or explore potential new categories, there are several different uses for agile research methodologies. From the outset of the first creative idea to the live advertisement, there are a lot of decisions that can send the creative on a path for success, or on a path to a dead end. Consumer feedback is largely the best way to make sure your creative is successful when it goes to market. However, without the proper execution of your research strategy, you still risk ending up with final creative that’s not compelling to your target audience. -Learn best practices for setting your creative up to succeed. -Explore common pitfalls of creative research and three tips to avoid them. -Hear real examples of creative research challenges, and their outcomes. Mobile surveys have quickly become mainstream with about 20% of all surveys being taken on a mobile device. As such, it is important to understand the best practices for mobile surveys, the benefits and drawbacks of mobile, and the expectations for mobile respondents. With precious little time to get creative right, copy research must deliver actionable and relevant insights. Thoughtful research strategy and design can be the difference between a successful creative execution and a missed opportunity to effectively reach your target audience. As online research becomes more prevalent, respondent fatigue and burnout are becoming more of an issue. In order to ensure that you receive rich, actionable feedback, respondents need to be kept engaged and feel encouraged to share their articulate opinions. One of the best ways to engross respondents in the research is to use creative projective techniques to add excitement to the study and topic. Suja, an organic beverage company, was looking to update the packaging for their number-one revenue driver. This was a big decision with a lot of visibility across the organization. They needed to know if the new packaging was going to perform at least as well as, if not better, than the current packaging in order to make a go/no-go decision. With their product’s peak season right around the corner, Suja turned to GutCheck to assess the risk of updating the product packaging. When a new company-wide initiative is being rolled out, it is critical to get consumer feedback early and often to support and validate those big decisions. When the global insights team at InterContinental Hotel Groups (IHG) was tasked with validating three new concepts that would have a big impact on the company, they needed a quick and affordable way to get quality consumer feedback. An agile approach gave IHG the flexibility they needed to get both quantitative and qualitative research at a price and within a timeframe the business could afford. The pairing of quant and qual research together enabled IHG to screen concepts with consumers for prioritization and further understand what consumers liked and disliked, specifically, about each concept. The quick feedback gained gave IHG the insights needed to optimize concepts and move forward with confidence. Advertising is a $570 billion global business with money being spent in three ways—media buys, creative production, and market research. Each piece of the advertising business is critical and when executed correctly, can make for an extremely successful ad. However, as we all know, budgets are tight and timelines are short. Furthermore, it can be hard to find the time and money to do validation testing on TV commercials, let alone research on early-stage creative and digital ads. And with the big shift to digital advertising, researchers need to rethink traditional research practices to ensure that their digital ad executions are getting the level of consumer feedback needed to support better media effectiveness. With the knowledge that clients are continually facing challenges around incorporating iterative consumer feedback early and throughout the creative process, GutCheck and Millward Brown came together to create Pre-LinkNow. Pre-LinkNow is a qualitative research solution that helps insights and brand teams integrate the consumer voice at any stage of the creative development process, from storyboard or sketch to final cut, regardless of medium. Pre-LinkNow is founded in the Millward Brown Link™ framework so you can use a common study language across qualitative and quantitative copy research. Gia Calhoun, Global Innovation and Insights Manager and beauty expert, discusses common pain points in the beauty industry and best practices around what types of research to conduct in order to solve for those. She also shares a case study explaining how agile market research can be used to uncover consumer opinions to create winning package designs that stand out on the shelf, fit with a company’s brand, and satisfy expectations of quality. Innovative. New. Leading-edge. These are just a few of the qualities most technology companies strive for. Whether that means further developing and refining an existing product or looking for the next big idea that is completely new and different, companies are always looking for ways to stay ahead of the competition. And Google is no exception. Google was developing a new product and needed a way to bring user feedback to the forefront of their development process. Using lean startup principles and agile methodologies, which were already a part of Google’s engineering DNA, Google was able to conduct several phases of research that helped them design a name and logo for their new product. Agile research helped Google incorporate user feedback frequently throughout the development process and enabled Google to answer their key questions in days so they could move forward quickly and with confidence. The dramatic growth in shopper research, spurred in part by innovations in the area of mobile data collection, is a huge shift in the market research landscape. Connecting with shoppers to understand why they make their decisions and how to influence those decisions can have a huge impact on the success of categories and brands. Getting this information in near real-time and in the shopper’s context using agile research takes that impact one step further by turning shopper insights into a major competitive advantage. Join our experts on agile shopper insights to gain an understanding of how to leverage quick shopper reads to gain the insights advantage that enable growth in sales and market share. Mike Twitty, Owner at First Light Insight and former Shopper Insights leader at Unilever, and Ann Koerner, VP of Product at GutCheck, will take you through the application of agile research to shopper insights, including case studies, and how it can impact sales tactics and shopper marketing. In a recent study of market researchers, 77% of respondents plan to increase adoption of agile research methods within the next 12 months. We recently conducted a “State of Agile Market Research” study of insights professionals, marketers and agencies to learn more about their understanding of agile market research and how it fits into their toolkit. The key takeaway: agile research is one of the biggest trends in the industry today because it allows researchers to stay in front of both the competition and needs of the business. In this webcast, we’ll share the tops five trends in agile research today and how they’re helping companies stay ahead of the game! No matter the budget, researchers always need quick insights and big results, fast. When in-person focus groups weren't fast or affordable enough to screen and refine their 30 early-stage concepts, Caribou Coffee was not content relying on their gut feeling to shape its innovation pipeline. They were determined to find a more innovative approach and decided to leverage GutCheck to eliminate bad ideas and optimize winning concepts. Using agile market research, Caribou was able to quickly screen concepts with statistical rigor AND obtain qualitative feedback used to refine concepts in just 5 days and at a lower cost than traditional focus groups. In the end, Caribou got the consumer feedback needed to move forward with confidence, and keep their budget intact. Learn how Bumble Bee Foods leveraged agile research to save the company money by making hard business decisions – backed by consumer insights. When executives come up with new concept ideas they strongly stand behind, it’s our job as researchers to gain consumer understanding to vet if it’s a quality idea worth moving forward with. This can be difficult, especially when research results and executive management’s opinions clash. Bumble Bee Foods’ innovation team was tasked by upper management to dive into a brand new category. Because this was so out of the box for them, they leveraged GutCheck’s qualitative offering – and their experienced, full-service research team – to quickly gain deep insights from multiple groups of targeted consumers, including the coveted Millennial generation. Tips and tools for conducting market research in the digital age. GutCheck is a global, online agile market research solution that enables our clients to get quick consumer reads to answer business questions as they come up.